CALGARY — Every remaining game both a dress rehearsal for the playoffs and an opportunity to strengthen their post-season position, the Calgary Flames weathered a desperate Columbus Blue Jackets for a 4-2 win Tuesday. 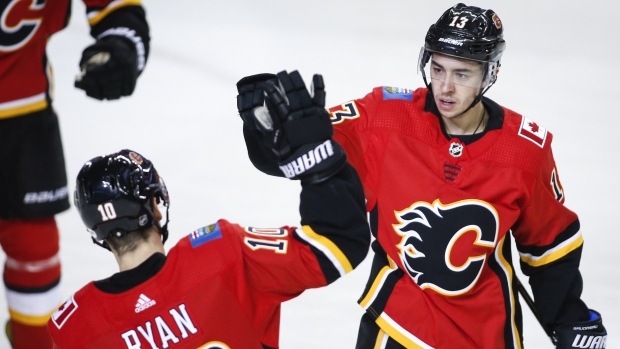 A 31-save outing by Flames goaltender David Rittich — who got a little luck from his goalposts too — helped Calgary move three points clear of the San Jose Sharks at the top of the Pacific Division. Johnny Gaudreau, Andrew Mangiapane and Michael Frolik scored for the host team with Matthew Tkachuk adding an empty-net goal. Austin Czarnik assisted on a pair of goals, while Rittich won his fourth start in a row. Oliver Bjorkstrand and defenceman Zach Werenski countered for Columbus. Sergei Bobrovsky stopped 28 shots in the loss. The first Western Conference team to clinch a playoff spot Sunday, the Flames (45-21-7) are still racing for first place in the division with nine games left in the regular season. The Sharks were idle Tuesday but their playoff spot was assured when the Minnesota Wild lost to the Colorado Avalanche. "It's nine games to the end, we got three points up so every single point is important," Rittich said. "We want to finish first." Columbus (40-29-4) holds down the Eastern Conference's final wild-card spot, one point up on Montreal following the Canadiens' 3-1 win in Philadelphia on Tuesday. Blue Jackets shooters hit three goal posts in their first 40 minutes in Calgary, prompting Rittich to give his posts a kiss during the game. "Three goalposts," Blue Jackets forward Matt Duchene lamented. "We're playing good hockey. Just not getting the offence when we need it. "We're finding ways to not score, I guess. It's frustrating, but you've got to keep going and have the faith that it's going to break. Today we lost some ground, but we're still in a (playoff) spot." Mangiapane scored with seven seconds left in the first period and Frolik 35 seconds into the second to give Calgary an early 3-1 cushion. Frolik took a neutral-zone dish from T.J. Brodie and gained the zone with speed. The Czech outmanoeuvred Blue Jackets defenceman Seth Jones to beat Bobrovsky. The Blue Jackets pushed back, however. Flames captain Mark Giordano helped Rittich out in net squeezing his body around the left goalpost to stop a Cam Atkinson shot late in the second period. The play was reviewed, but no goal awarded. "It was kind of old school, but I'm not surprised. Look at his age," Rittich quipped. "It was really good." While Bjorkstrand scored a power-play goal early in the third to pull the visitors within a goal, Rittich stymied a second man-advantage midway through the period when Calgary was called for delay of game. "There was a few I thought he made look easy that were difficult saves.," Giordano said. "That was huge for us. "They had a push for sure. They're a desperate team. A really big, strong team that plays well. Their defencemen get in the rush, so it was an important two points for us tonight and I thought we dug deep." Goalpost karma and Giordano assistance aside, Rittich didn't give up rebounds to Columbus for follow-up chances. "There wasn't much laying around," Flames head coach Bill Peters said. "I thought he was real tidy." Calgary defenceman Noah Hanifin blocked a shot with the back of his head midway through the second period. He left the game, but returned to play the third. Notes: Flames centre Sean Monahan (illness) and winger Sam Bennett (upper body) were scratched a second straight game . . . Giordano tied Robyn Regehr for the second-most games played by a Calgary Flame with his 826th . . . With an assist Tuesday, Giordano has five in his last five games.